Barton, William E., The Soul of Abraham Lincoln, (University of Illinois Press, 2006). Fox, George S, Abraham Lincoln's Faith-Based Leadership, (Authorhouse, 2005). Guelzo, Allen C, Redeemer President, (Erdman's, 1999). Jackson, Samuel Trevena, Lincoln's Use of the Bible, (New York: Eaton & Mains, 1909). Macartney, Clarence Edward, Lincoln and the Bible, (Abingdon-Cokesbury Press, 1949). Schwartz, Earl, "A Poor Hand to Quote Scripture": Lincoln and Genesis 3:19, Journal of the Abraham Lincoln Association, Summer 2002. Temple, Wayne, From Skeptic to Prophet, (Mayhaven Publishing, 1995). Thompson, Kenneth W., editor Essays on Lincoln's Faith and Politics. 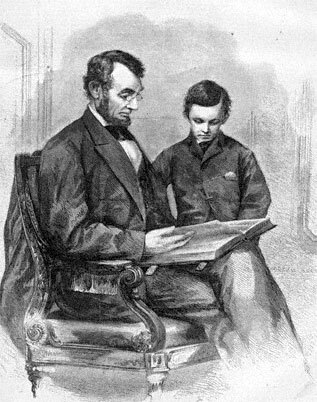 When Abraham Lincoln visited his friend Joshua Speed in Kentucky in the summer of 1841, Speed’s mother gave him an Oxford Bible. When Mr. Lincoln returned to the judicial circuit that fall, he wrote Speed’s sister back in Kentucky: “Tell your mother that I have not got her ‘present’ with me; but that I intend to read it regularly when I return home. I doubt not that it is really, as she says, the best cure for the ‘Blues’ could one but take it according to the truth.”1 Because Mr. Lincoln had suffered severe blues in January after breaking his engagement with Mary Todd Lincoln, an antidote was needed. The “house divided” analogy from his 1858 Republican nomination speech for the Senate. His reference in his First Inaugural Address to “a firm reliance on Him who has never yet forsaken this favored land”. Roy P. Basler, Editor, Collected Works of Abraham Lincoln , Volume I, p. 261 (Letter from Abraham Lincoln to Mary Speed, September 27, 1841). Roy P. Basler, Editor, Collected Works of Abraham Lincoln , Volume VII, p. 542 (Reply to the Loyal Colored People of Baltimore upon Presentation of a Bible, September 7, 1864). Herbert Mitgang, editor, Washington, D.C., in Lincoln’s Time: A Memoir of the Civil War Era by the Newspaperman Who Knew Lincoln Best, p. 252 (Noah Brooks). Paul Angle, Lincoln’s Power with Words, Journal of the Abraham Lincoln Association, 1981, p. 13. Earl Schwartz,”‘A Poor Hand to Quote Scripture’: Lincoln and Genesis 3:19,” Journal of the Abraham Lincoln Association, Winter 2002, pp. 37-38. Elton Trueblood, Abraham Lincoln: Theologian of American Anguish, p. 50. Julia Taft Bayne, Tad Lincoln’s Father, p. 183. Clarence Edward Macartney, Lincoln and the Bible, p. 84 (See William E. Barton, The Soul of Abraham Lincoln, pp. 93-94). Roy P. Basler, Editor, Collected Works of Abraham Lincoln, Volume II, p. 501 (Speech at Chicago, Illinois, July 10, 1858). Michael Burlingame, editor, An Oral History of Abraham Lincoln, John G. Nicolay’s Interviews and Essays, p. 95 (Letter from Rev. Albert Hale to Rev. Theron Baldwin , May 31, 1860) . Clarence Edward Macartney, Lincoln and the Bible, p. 77. Allen C. Guelzo,”Holland’s Informants: The Construction of Josiah Holland’s ‘Life of Abraham Lincoln,'” Journal of the Abraham Lincoln Association, Winter 2002, p. 28 (Letter from Newton Bateman to Josiah G. Holland, June 19, 1865). Don E. and Virginia Fehrenbacher, editors, Recollected Words of Abraham Lincoln, p. 273. William Wolf, The Almost Chosen People, p. 134. Alexander K. McClure, Lincoln’s Own Yarns and Stories, p. 90. Clarence Edward Macartney, Lincoln and the Bible, pp. 74-75. Thomas N. Pendel, Thirty-Six Years in the White House, pp. 25-26. William Wolf, The Almost Chosen People, p. 132. Earl Schwartz,”‘A Poor Hand to Quote Scripture’: Lincoln and Genesis 3:19,” Journal of the Abraham Lincoln Association, 2002, p. 38. William E. Barton, The Soul of Abraham Lincoln, p. 275. Roy P. Basler, Editor, Collected Works of Abraham Lincoln, Volume VII, p. 542 (Reply to Loyal Colored People of Baltimore upon Presentation of a Bible, September 7, 1864). Roy P. Basler, Editor, Collected Works of Abraham Lincoln, Volume VII, pp, 543 (Statement by S.W. Chase to President Lincoln, Washington Chronicle, September 8, 1864). Ward Hill Lamon, Recollections of Abraham Lincoln, 1847-1865, pp. 114-115. Rufus Rockwell Wilson, editor, Intimate Memories of Lincoln, p. 22 (Joshua F. Speed, 1880). Wayne Temple, From Skeptic to Prophet, p. 269. Lucius E. Chittenden, Recollections of President Lincoln and His Administration, pp. 449-450 (Chittenden’s reliability in presenting facts as well as Lincoln quotations has often been questioned). William Wolf, The Almost Chosen People, p. 139.